Background: The aim of this study was to determine the incidence of coexisting symptomatic lumbar canal stenosis (LCS) in patients after surgery for cervical spondylotic myelopathy (CSM) and identify possible predictive factors associated with it. Materials and methods: We retrospectively reviewed patients with CSM at our institution between January 2005 and December 2015. Clinical and radiographic factors including age, gender, body mass index, Japanese Orthopedic Association scores, cervical alignment, anteroposterior diameter of cervical canal, number of levels with CSM, and percentage of cervical cord compression were investigated. 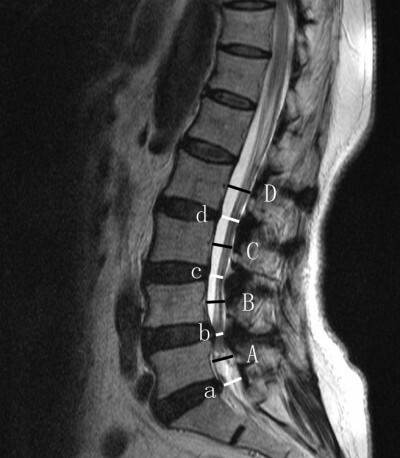 Symptomatic LCS was defined as leg symptoms and a narrowing of the lumbar spinal canal at one level at least, which is confirmed by magnetic resonance images of the lumbar spine. Univariate and multivariate analyses were used to identify possible predictive factors. Pearson correlation analysis was also conducted to analyze the association between cervical parameters and percentage of LCS. Results: A total of 317 patients with CSM met the criteria for inclusion. There were 39 patients (12.3%) with LCS after cervical surgery during a mean of 7.3 years’ follow-up. In the multivariate logistic regression analysis, narrow diameter of cervical canal (OR, 3.96; 95% CI, 1.20–13.04) was identified as the only independent predictor of symptomatic LCS in CSM patients. The correlation coefficient between anteroposterior diameter of cervical canal and severity of LCS indicated a significantly positive linear relationship with 0.536 (P<0.001). Conclusion: We found that narrow diameter of cervical canal was associated with symptomatic LCS in CSM patients. Patients with this risk factor should be informed the possibility of symptomatic LCS.